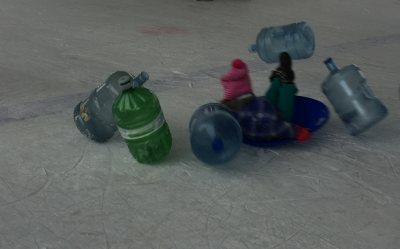 Family Day Winter Classic 2018. 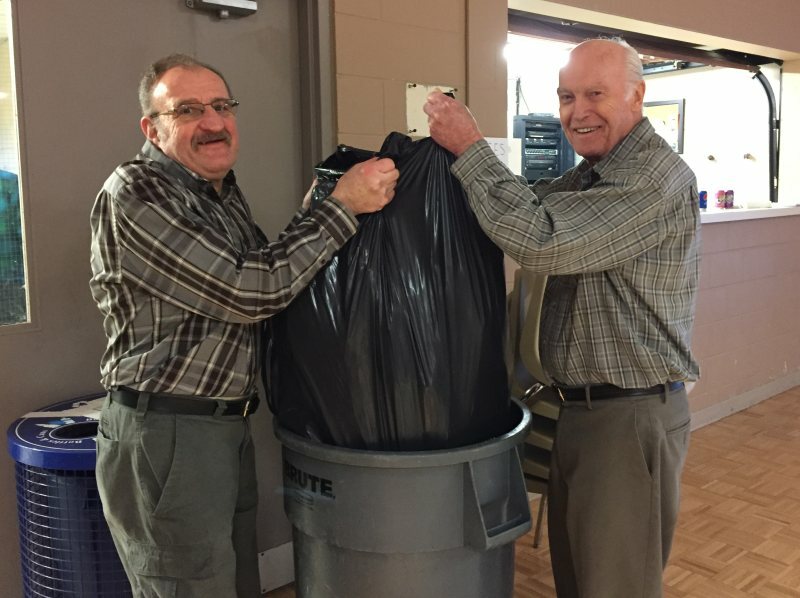 Thank You Puslinch Optimists! 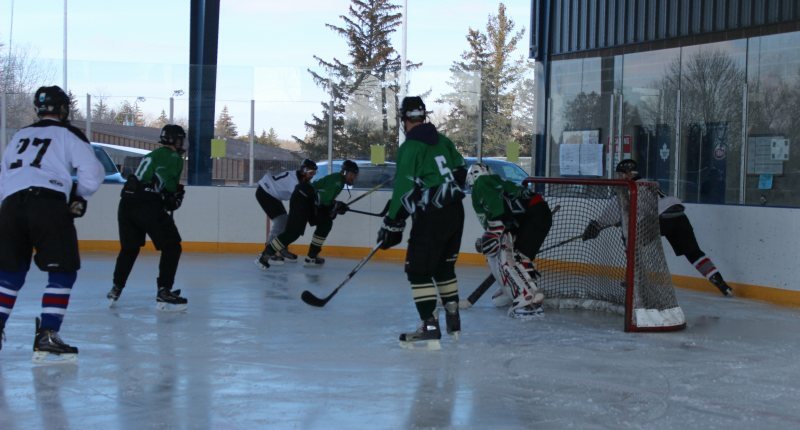 It all began on a cold but sunny Saturday morning with many hockey teams signing up to play a 4 on 4 game. 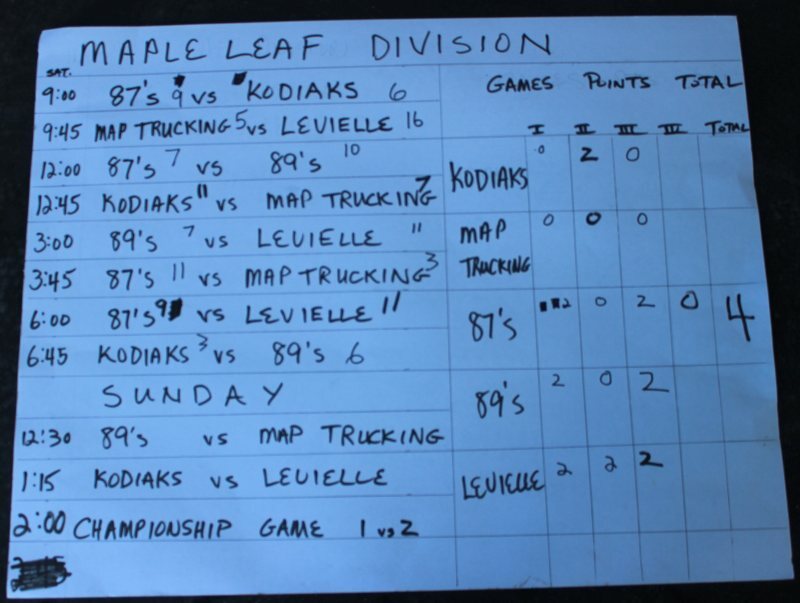 Some teams were local and some were from as far away as Niagara Falls. The games were quick and lots of action could be seen on the ice. The games ended on Sunday with many of the players going to the community center to grab a bite to eat and perhaps talk about the one that got away. 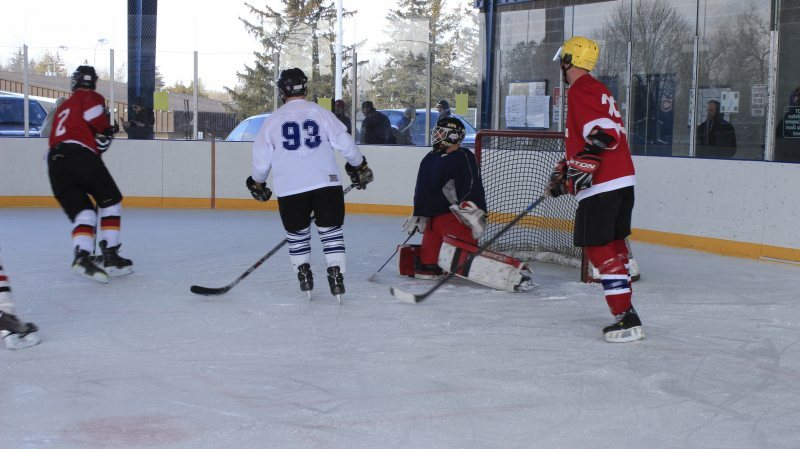 Overall it was another successful hockey tournament sponsored by the Puslinch Optimist for the annual Family Day Weekend Event. 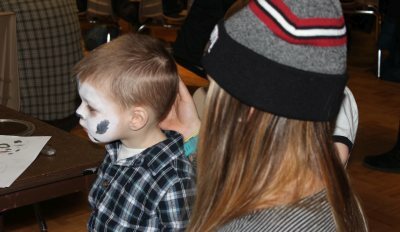 The free family day event started out with a perennial favourite called Face Painting. 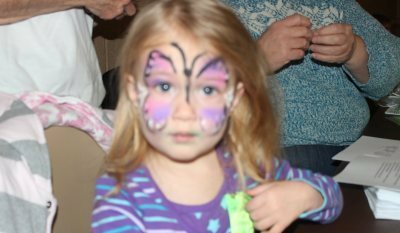 Claire was thrilled with her butterfly face. While Noah waited patiently to be turned into a puppy. This event started at 11 am and finished at 3 pm. It always had a line! Thank heavens the magician could be seen from the painting station. 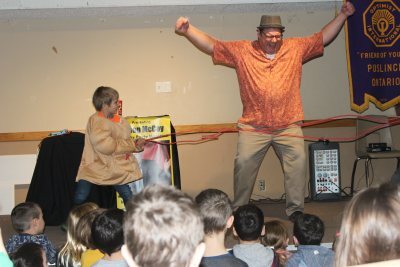 Next up was Scoop the Magician. Adrian was first up to help with stamping out a mouse balloon. It later came back to life which was a surprise to all of us. Lucas helped Scoop by showing him all his manmade “muscles”. The rope came off easily with his help. Then everyone was ready to be the characters for a fairy tale story. Have you heard the one about a princess, a thief, a dragon and a frog? I hadn’t either but Scoop put together his own version of this. It thoroughly enjoyed by everyone! Boy oh boy do the optimists know how to throw a party. 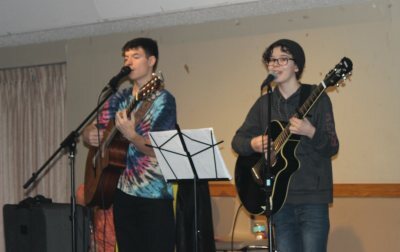 While the performers were singing Doug and Barry were getting ready to pass out the 250 hot dogs, hot chocolate and water. As you can see it was well received by Sam, Jonathan and Kaden. Yummy! Then I headed outside for more fun and activities. 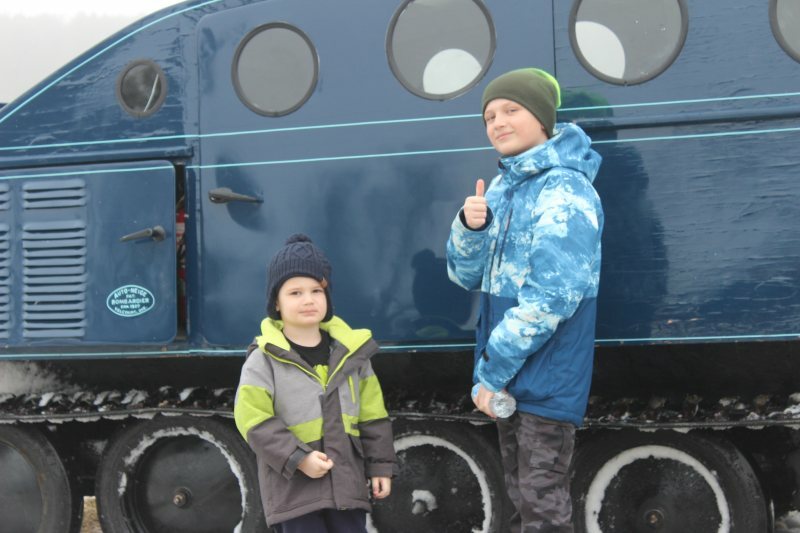 Calvin and Jaxon were thrilled go over man made bumps while having a ride on the Bombardier School bus. 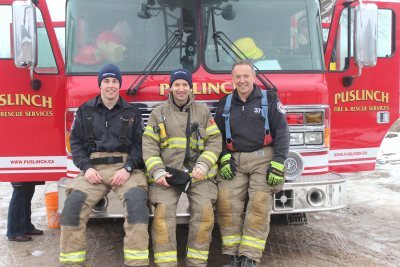 A couple of firefighters were outside showing off another favourite activity. Who doesn’t like to pretend that they would like to be a fire person when they grow up? 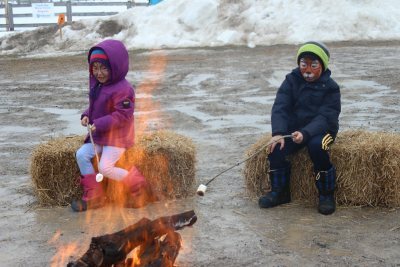 There was also an outside fire pit where you could roast your marshmallows. 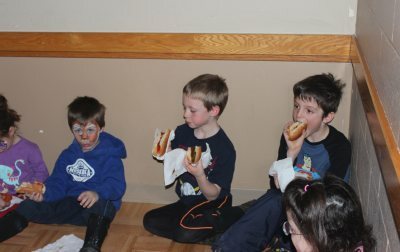 I’m pretty sure they tasted even better after having your face painted. 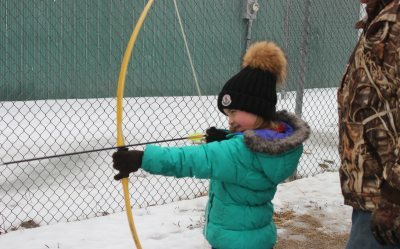 Other activities I observed were archery, ice skating and a game of human bowling. The gym was full of children and adults playing dodgeball. Awesome participation by all. I forgot all about the nature walk happening on the Wayne Stokley trail. 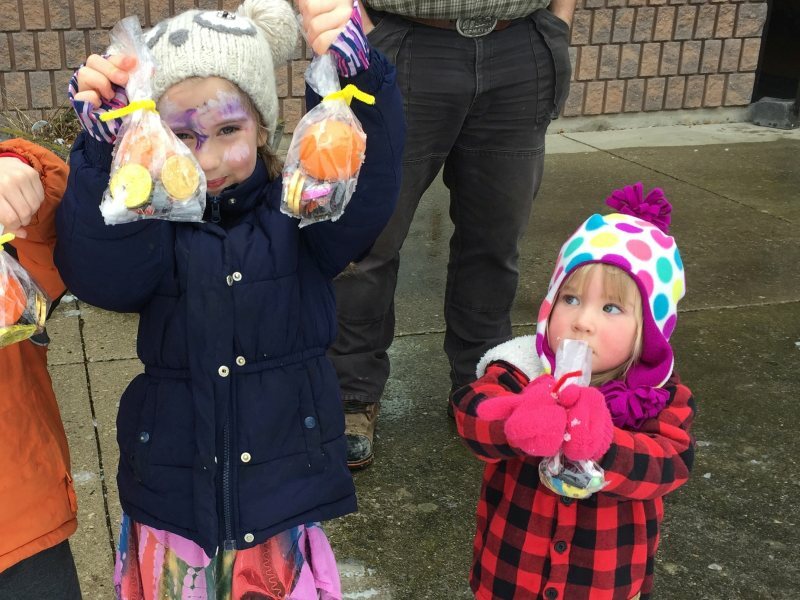 The merriment of the day could be seen on children and adults faces alike. Squeals of delight were heard all over that day! 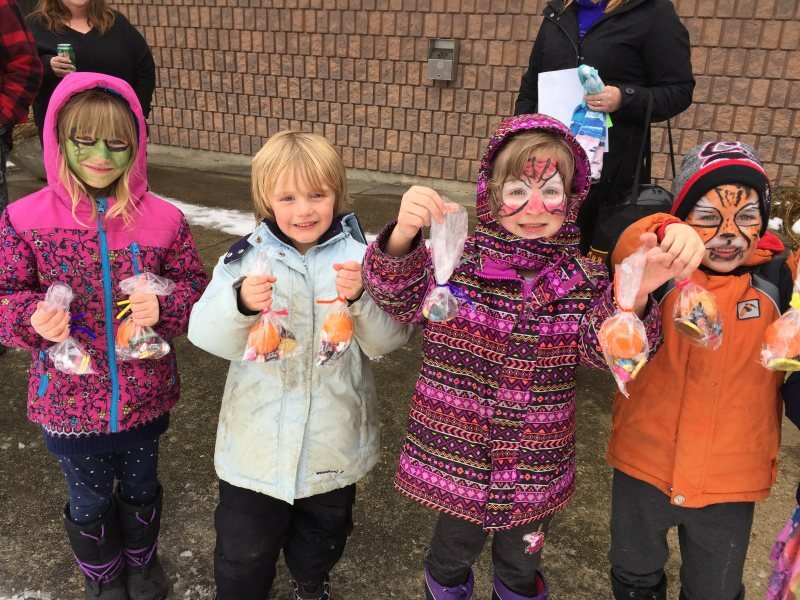 Though none were as loud as when many bags of candy were pulled out of the snow on the Scavenger hunt. As with any event many hands make light work. 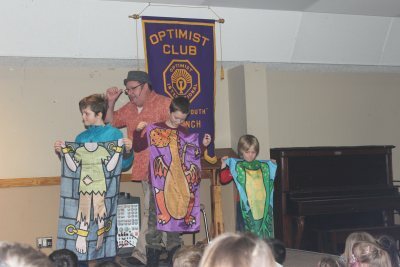 Thank you to ALL the optimists for ALL the events!